Building strong all-people national defense in each region and area and nationwide is our Party and State’s consistent strategy. As regards Ha Nam, which holds a strategic position in economic, social, defense and security fields, its successful implementation of this task is of utmost importance. Therefore, the province has attached great significance to performing the task via proper, synchronous solutions. Comprehending the Party’s defense-military guidelines, over the past year, the Provincial Party Committee and People’s Committee have carried out defense-security tasks in line with local particularities and missions, with due attention paid to building the all-people national defense in the area by the all-level authorities and sectors, the armed forces and the entire people. 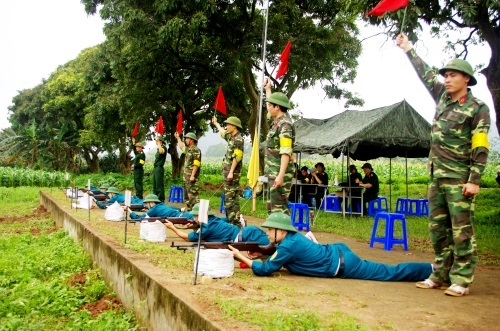 As a result, awareness and responsibility of cadres, party members and all people in the province towards defense tasks have gradually been raised while the “people’s hearts and minds posture” has been regularly strengthened, providing the basis for building the all-people national defense and the people’s security. The province has always reached and exceeded the preset economic targets. The building of the political system, unions, socio-political organizations and armed forces has witness positive changes. The security-political situation remains stable. Due regard has been paid to the policy work for the society and the military rear. People’s living conditions have considerably improved. Potential, force and posture of the provincial and district defensive zones have been consolidated. Local armed forces’ synergy and combat readiness capability have been enhanced dramatically, meeting the requirements set by the Homeland protection in the new situation. However, a section of cadres, party members and people, even several leaders of offices and units have yet to be fully aware of and highly responsible for defense-military tasks. District-level military agencies’ capacity to offer recommendations to local party committees and governments on building and managing the reserve forces and the militia and self-defense forces as well as planning the construction of military works in defensive zones has yet to meet the requirements. The building of resources and the mechanisms for mobilizing them in the defense tasks, particularly in contingencies, have been still limited. To overcome the weaknesses and improve the effectiveness of building the all-people national defense in the area, the province has determined to continue grasping and implementing the guidelines on building the all-people national defense by the Party, the Central Military Commission and the Ministry of National Defense, particularly the Resolution of the 12th National Party Congress, the 11th Politburo’s Resolution No.8 on the Strategy to defend the Homeland in the new situation. Moreover, it has paid due attention to increasing resources for defense and security and building strong forces and defense and security postures, thereby creating the synergy to foil all hostile plots and acts of sabotage, prevent and refute wrongful information and arguments, effectively respond to traditional and non-traditional security threats, and maintain political security and social order in the area. The province has focused its direction and leadership on enhancing defense potential, first and foremost economic potential and political-spiritual potential. This provides an important basis for increasing local defense strength to meet the requirements set by defense mission in peace time and to readily transform into real defense strength in war time. To this end, the province has decided to actively promote all its potential and advantages and speed up socio-economic development as the central task of the Provincial Party Committee, Authority and people. Accordingly, it has concentrated on developing key economic sectors (supporting industry, hi-tech agriculture, building material industry, etc.) as a driver for developing other sectors and fields in order to facilitate socio-economic development and serve defense-security tasks in both long and short terms. At the same time, its economic structure has been shifted to industry and services while the disposition of residential areas and the building of infrastructure, particularly industrial parks, traffic system, urban areas, posts and telecommunications system, new-type rural areas have been adjusted to ensure duality. It has followed the guidelines in which every socio-political development would help enhance defense-security potential and strength, and robust defense and security would in return maintain stable environment for rapid, sustainable socio-economic development. Concerning the building of political-spiritual potential, significance has been attached to the work of education and propagation to raise awareness, responsibility and revolutionary vigilance of its cadres and party members, the whole political system, and the entire people towards the implementation of defense tasks. Due regard has been paid to building the system of party organizations, authorities, and unions at all levels, particularly those in the armed forces so that they have leadership capability and high combativeness while effectively managing and operating defense-military activities. The role of the Council for defense-security education at all levels has been promoted. Form and method for defense-security education have been renewed to make cadres, party members and people clearly understand the situation in the world, region and country, hostile plots and artifices, the Party’s guidelines for building the all-people national defense, and local defense-military missions as well. Consequently, patriotism, love for socialism and self-consciousness within the political system and organizations, and among the people in the province towards the building of the all-people national defense have been aroused. The patriotic emulation movement has been stepped up in line with the implementation of the Resolution of the Party Central Committee’s 4th Plenum (12th tenure) and the Politburo’s Directive No.5. Due attention has been paid to building the great national unity block. The Grass-Roots Level Democratic Regulations have been well implemented. People’s material and spiritual life has been improved, thereby strengthening their faith in the leadership and management of party committees and authorities at all levels as well as the country’s Party-led reform. Second, building strong defense forces, meeting the requirements of Homeland protection. Grasping the Party’s new viewpoints on local defense-military work, the province has taken measures to build the defense forces, with a focus on building strong local armed forces. Regarding the active forces, the province has followed the direction “elite, lean, strong, maneuverable, flexible” and concentrated on building the increasingly high synergy, particularly political quality, and combat readiness level and capability. The reserve forces have been built in accordance with its particularities. It has well conducted the work of registration, management and inspection of reservists and technical means of the economy to maintain readiness for mobilization when necessary. The militia and self-defense forces have been made “strong, extensive” under the Law on the Militia and Self-Defense Forces and its Project to build the forces during the 2016-2020 period, meeting the requirements of proper quantity, equipment and structure, with priority given to building mobile militia forces and arm militia and self-defense forces. Military offices at all levels have proactively worked with other functional offices to counsel the province to establish military commands and self-defense forces within enterprises, particularly the foreign-owned ones, thereby creating strong all-people national defense posture, effectively handling the situations at grass-roots levels. In addition, the Provincial Military Party Committee has stepped up introduction and implementation of higher echelons’ directives and resolutions, particularly the Central Military Commission’s Resolution 765-NQ/QUTW, dated December 20th, 2012, and the Special Resolution 580-NQ/ĐU, dated April 10th, 2014, by the Provincial Military Party Committee on renovating and improving the quality of training, while directing units to conduct training for troops. Focuses of training have been placed on mastering materiel, particularly modern one, in line with situations and projects to defend the areas; on holding commune-level defensive exercises, air defense exercises, flood and storm prevention and control exercises, search and rescue exercises, etc., to enhance the combat readiness level and capability of the local armed forces, meeting the requirements of Homeland protection. Third, proactively building strong all-people national defense posture in association with people’s security posture in each region and area. Perceiving the 10th Politburo’s Resolution No.28 and the Government’s Decree 152/2007/NĐ-CP on building defensive zones, the province has focused its leadership on building the national defense posture in accord with the master plan for socio-economic development as well as each locality’s particularities, missions and operational projects. In this regard, the building of national defense posture must be flexible, interconnected, and strong, with a close combination of on-spot forces’ posture, the Military Region’s defensive posture and posture of the National Defense Ministry’s units stationed in the area. In the coming time, while effectively implementing the Project on stepping up the local defense-military work, the Provincial Military Command should closely cooperate with localities and sectors in building several military works within the defensive zones in the 2016-2020 period. During the course of implementation, it is necessary to build new caves and works and upgrade the old ones into an interconnected, strong system. Priority should be given to building essential works. Importance should be attached to promoting the role of the Steering Board for Defensive Zones, the Steering Board for People’s Air Defense, and the Supply Council in helping the Provincial Party Committee and People’s Committee lead and direct defense-military tasks via resolutions, inspection, supervision, and review, in order to improve the effectiveness of planning, building, exploiting, managing and protecting the works. It is noted that the province has attached significance to dual-use works in line with the Party’s guidelines on combining economic development with national defense and vice versa. 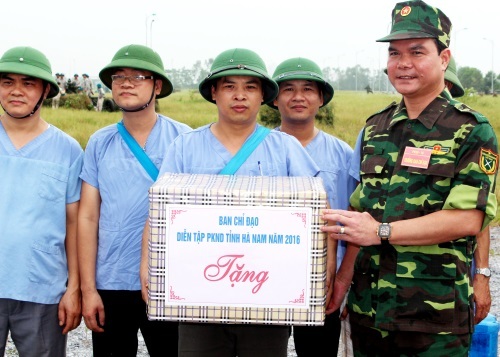 Successful implementation of measures to build all-people national defense will contribute to Ha Nam province’s fulfillment of tasks of socio-economic development and Homeland defense in the new situation.